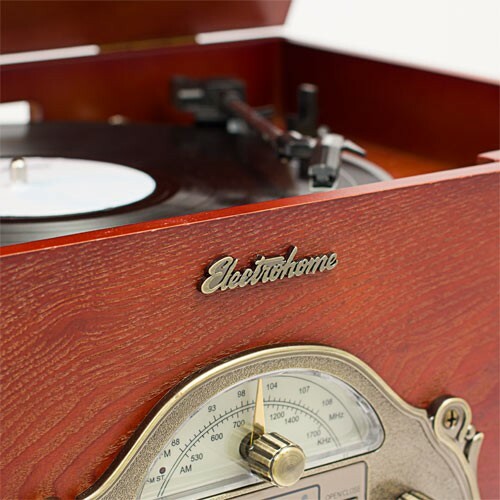 Enjoy an amazing audio journey with a classic design from Electrohome's 100+ years of history. 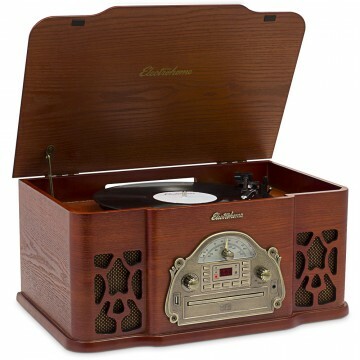 Made with real wood, you can play your entire collection of vinyl records, CDs, AM/FM radio and even connect your smartphone or tablet. You have many options with this unique 3-in-1 system. The old-fashioned look will match any decor, while the rich sound from the speakers will play in crystal clarity. Not only is this system great for entertainment purposes, the old-fashioned look of this music player also makes it a great addition to any room in your home. 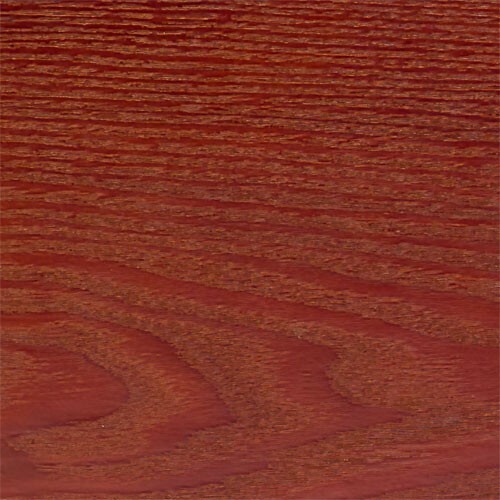 The real wood finish and classical design will complement your decor perfectly, and will bring you back to a time when just a penny would give you a melody and a dance. 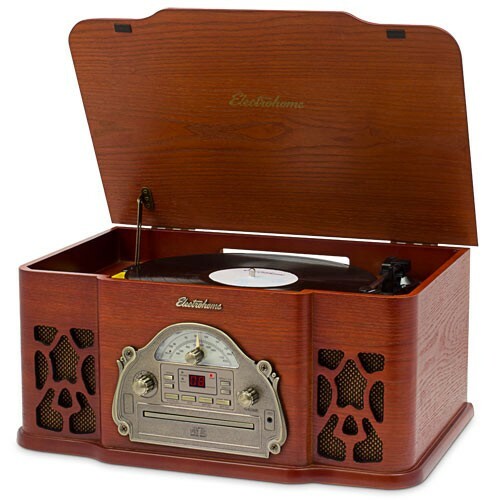 Sit back and relax while you listen to music from your record collection, CDs, or even the radio. 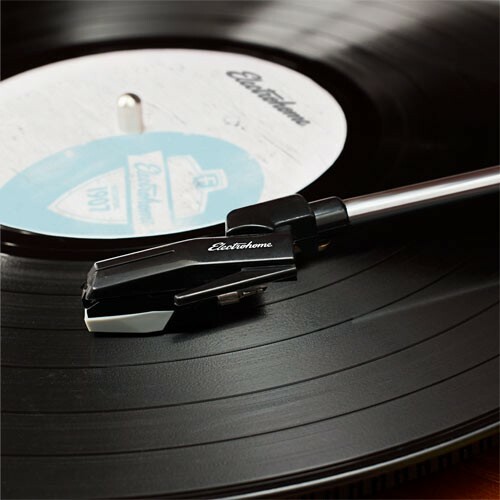 The belt-driven turntable plays 7, 10 and 12” records at three speeds of 331/3, 45 and 78 revolutions /minute, so that your entire vinyl library can be enjoyed. You can also listen to your favorite radio station with the AM/FM tuner. The powerful speakers in this system allow for high fidelity sound, whether you're listening to your favorite record, CD, or radio station. 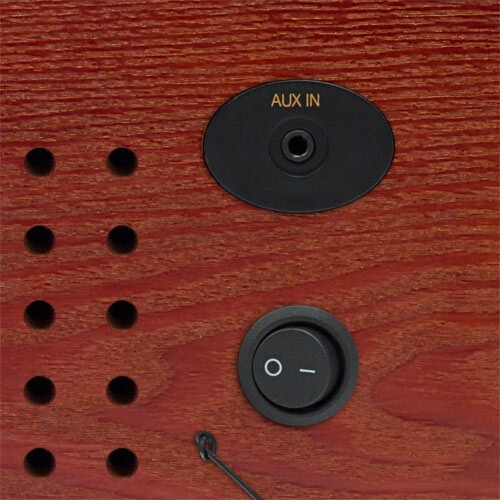 For private listening, a 3.5mm headphone jack is built into the front of the unit. 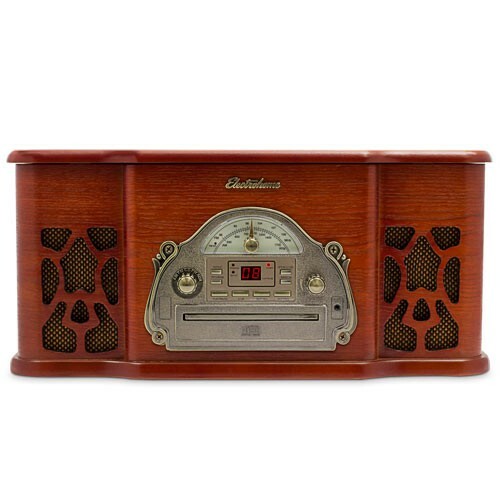 The radio tuner on this stereo system makes it look like an old-fashioned radio, consisting of a rotary control knob and analog radio dial. The dial is even backlit to give it an authentic look, and allows you to easily see the controls in the dark. Upholding Electrohome's strong reputation for solid design, this stereo system is built to last. Made of high quality components, you will enjoy this reliable system for years to come. Rubber feet on the bottom of the unit will protect your furniture from scuffs or scratches. I bought this as a gift for christmas and after searching everywhere, this was the best one! Other vintage looking ones have a cheaper wood feel to it but this one was perfect! Am pleased with the sound. Wish it were easier to read the dials. The record arm does not retract automatically. 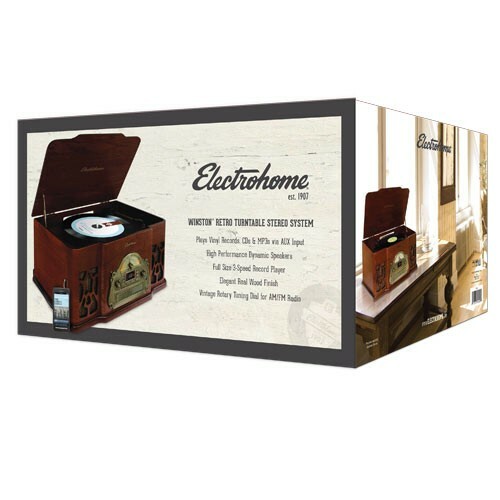 first off the website goes to great lengths to promote the history of 'Electrohome' but in reality this company CWD bought the name and this is cheapo made in china crap just like you see everywhere these days. not built to last, cheapest components, and zero QA all wrapped up in marketing & promoted with a classic name that gives the illusion of quality from days long long gone by. mine arrived damaged - clearly from the factory as the boz was not damaged - top lid broke off and screws missing. 2. top lid arm very cheap hardware and will not last multiple open and close sessions. 4. that nice dial glow pictured on the website and photoshopped into non-reality is actually two (very bright yellow) led lights that don't back light the dial with a nice warm glow - they are like headlights on the front of a car. 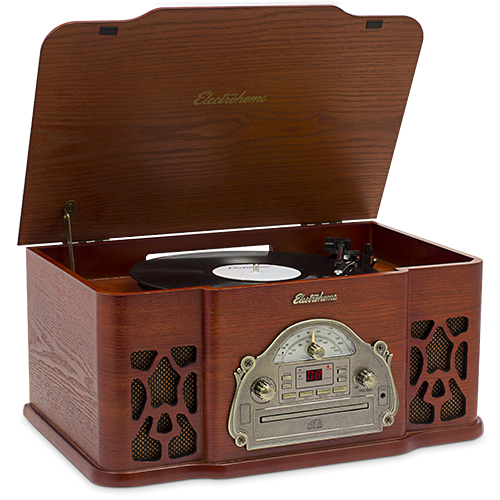 5. the record player - it worked, it sounded ok, but you cant get past the extremely cheap hard plastic record platter - at-least they could have placed a nice record pad on it to hide the cheapness. 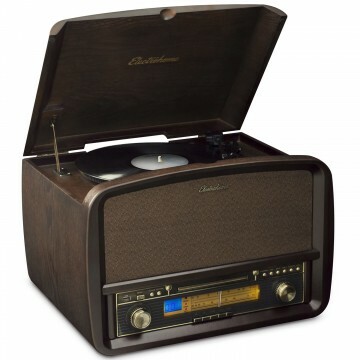 I would have gladly paid more for a quality vintage system like 'electrohome' produced turn of the century - unit going back and I will shop elsewhere. 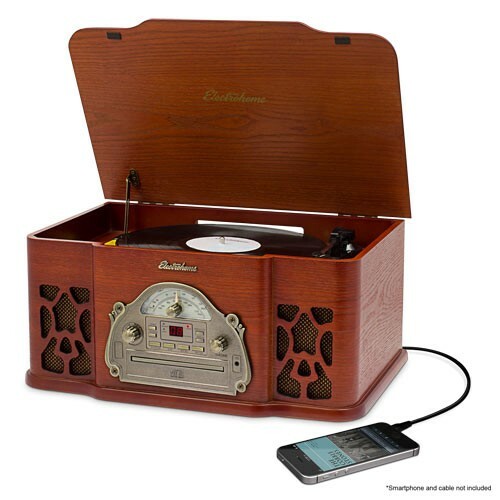 Record Players still have their place in this world.